I totally agree with you Rachel that I don't have time to keep tabs on the follows and unfollows either! Life is just too busy... but in saying that I sometimes see a flux of people (and it is usually the same people everytime) who will participate in a group following, etc. and then you see that they unfollow you and it happens again and again and you start to see a pattern. I totally agree with the idea of really getting to know people before following them as then it will be people that you genuinely want to get to know not just to follow for follows sake! Thanks for stopping by and sharing your thoughts! This was very interesting to read. I haven't been blogging for an entire year yet, but I feel like I follow most of these rules. I wouldn't mind if someone unfollowed me if they found out I wasn't talking about things they personally liked, but I do find it tacky to join a follow thread and then immediately unfollow the people you just followed and who followed you back. Not cool. Totally agree with you Danielle!! I don't really watch or keep an eye on the whole unfollow/follow thing but sometimes it is SO obvious that it makes you question the motive! Seeing someone "steal" a photo is horrible. I can't stand when people re-post images without giving proper photo credit. UGH! Oh I know!! For me to Elise!! As a lady who loves photography I was shocked when this happened! Honestly I couldn't believe someone would do that (without crediting the source)!! Thanks so much for letting me know that I am not alone in that thought!! I've seen so much of this since I started blogging this past spring! I definitely agree with you that it's so important to give other bloggers credit for any ideas of their we use. The following stuff on the Facebook groups is hard too...I'm not a fan of the all or nothing threads because I feel like I end up following people I just don't really resonate with! It's taken a while, but I'm learning to be slow and more intentional with who I follow and share. It definitely makes a big difference! I love that you said that Lauren about being intentional with who you follow! For me personally I think that the whole "all follow" works well if you are just starting out and getting into blogging world, but otherwise I think that being intentional and really growing your unique audience and voice is SO important. Thanks for sharing your thoughts!! These are so fantastic! It's really helpful to have them laid out. 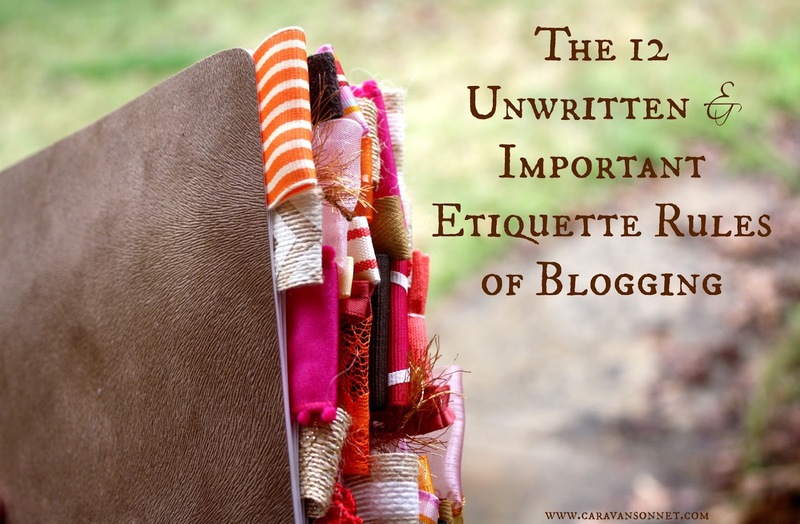 And I've only been blogging for 2 months and I can already see how #12 is possible. Great tips! I especially loved your #9. Not just "makers" will do this- bloggers will too! It really grinds my gears. If the comment is self serving, I don't publish it. It is that simple. I always try to think about my comments before I make them in terms of "Is this comment giving, or unconsciously self serving". I AGREE completely - Love this motto that you have!! These are all really great tips that I believe all of us, bloggers, should follow! I always try and give shout outs to bloggers and re-tweet their posts because I would want people to do the same for me. I think it's just a curtesy! I also love when bloggers give thought provoking or really great comments on my blog. It makes you feel like they actually did take the time to read what you had to say. In the end it makes for a beautiful circle of life as a blogger. Thanks for sharing these! It was beautifully written! I agree! Doing the things that you mentioned does make for a beautiful circle of life as a blogger!! Great thought!! Thank you for your encouragement and for stopping by!! I love this list! Blogging is a space where it's hard to regulate behavior, but I like to believe that those who genuinely engage, support, and encourage will be the most successful. All that "cheap" behavior can't carry you too far. This is a great post. I belong to several groups and find see-saw following so frustrating - liking then unliking when the thread is closed is just rude. I've also been in a couple of All or Nothing threads where I've followed/liked everyone but NONE of them have followed/liked me. A part of me feels like a sulky three year old but the rest of me thinks 'hey wait I'm sharing you with my audience, it would be nice if you returned the favor'. This is a great list - thank you. I totally agree with you- the whole follow/no follow thing can be a mixture of emotions! I have had that situation that you described happen to me and it is NOT fun! Thank you for sharing your experience!! Love the list...I'm happy that I already do just about all these things and I pretty new to blogging. It's nice to get validation that what you are doing is the right thing. Thanks Kim for your thoughts and for stopping by! Also- welcome to blogging!! Oh my gosh...YES. I loved the one about not copying some else's pictures...one time I remember going on Instagram and seeing that someone literally copied 4 of my pictures and reposted them on their account without crediting me. I take pride in my photography and was so upset!!! I don't even know if they were a blogger but still....it struck a chord! Such wonderful advice! That's so strange what happened to you in Instagram - what can you do about it? I think it's rude to follow and immediately unfollow, but that's why I don't do the all or nothing threads. Thanks Lindsay- it was a crazy experience. I actually ended up blocking and reporting this person because it literally became every single time that I would post it started happening. It was the strangest thing!! It drives me CRAZY when I get followers on social media, who then unfollow me a few days later. Sometimes I'll see the same person do it multiple times over the course of the month to hit a blogging group quota. I totally agree with you!! It can be a weird feeling when people continue to unfolllow and follow!! So sorry that this happened to you!! Oh my gosh, these are so true! 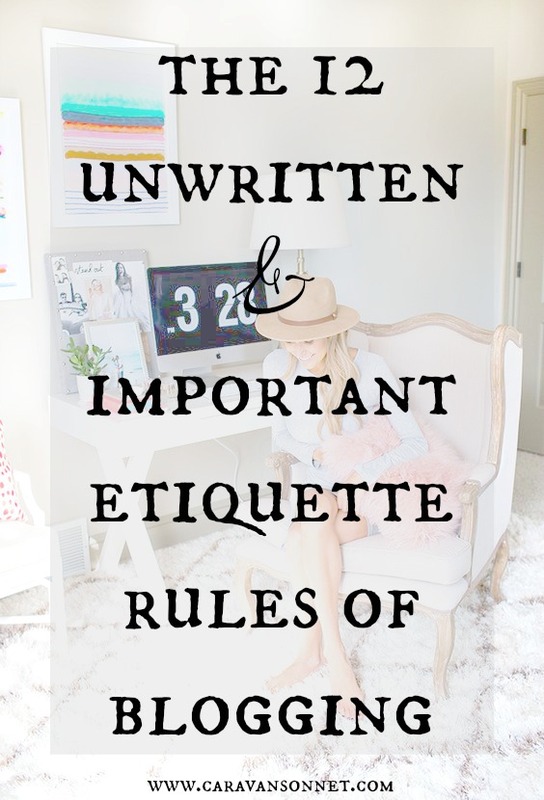 Unfortunately, so many bloggers don't follow these! I hate participating in a follow thread and then having several people unfollow me the very next day. I totally agree with you Erin! You are right! Some people just don't get it- bloggy world can be a strange place!! Great post!! You've definitely hit the nail on the head with these points!! Thank you so much Julie for your sweet note and for taking the time to comment on this post! I hope that you are having a wonderful weekend!! This post is so point on, girl! We're trying so hard at Passion Project to get these rules out there and encourage our members to follow them, which is why we're one of the only groups who actually follows up with your members and makes them finish threads, haha! Thanks girl! I can totally see how hard y'all work at Passion Project to get these rules into existence!! I have appreciated all of the work that y'all put into the blogging world! You are so wise :) And I am also laughing at myself because I don't even know what a blogging group is.. somehow I have been blogging for a few years and am still not up to speed on so much of it! I guess I just dip in and out of it as I have time and energy to produce posts :) So thanks for sharing your advice and knowledge with little ol me!! Hahahaha- You are my favorite friend!! Sending lots of love to you and that precious new little one! !